Previous drafts of the Asteroids movie were apparently not up to snuff, as Universal has hired Jez Butterworth to rewrite the film. 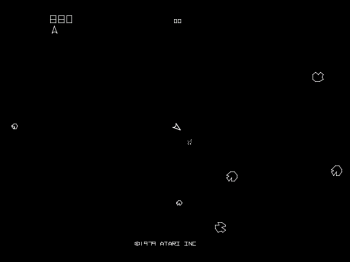 I hope I'm not blowing anyone's minds, but yes, there is a film adaptation of the Atari classic Asteroids in the works at Universal Pictures. How does Universal think it can cobble together a serviceable movie from a game that can be described in its entirety as "tiny ship shoots giant rocks ad nauseam" is anyone's guess, but it seems the studio has found someone who might know: Jez Butterworth, the movie's newest screenwriter. Variety reports that Butterworth has signed an agreement to rewrite the Asteroids script originally penned by Matt Lopez and Evan Spiliotopoulos, though details on the new plot are utterly lacking. For that matter, we know nothing about the prior, now-scrapped plot. Presumably it involves asteroids of some kind? Maybe a ship? Possibly some of those annoying flying saucers? While Butterworth's IMDB profile is well-stocked with actual feature films, he's not done anything really high-profile as of yet, so we don't have any idea how to feel about this news. Honestly, we're too baffled at the idea of an Asteroids movie by itself to attempt the formation of any solid, witty opinions. I mean, c'mon, how does Asteroids become a feature film? Battleship was a massive silver screen debacle, yet somehow Universal feels that adapting a game with even less plot potential will work out for the best? This is just an effort to piggyback on the presumed, near-future popularity of videogame film adaptations, isn't it? Ubisoft is busy pushing multiple gaming properties toward theaters, and it seems that Universal also wants to slice off a piece of that pie. Will this prove lucrative? Who cares? As much as the concept of an Asteroids film sounds like a trainwreck on paper, I can't wait to see what it looks like in reality. At best it will be a serviceable film, and at worst it will be the new low-water mark warning game creators away from signing contracts with anyone who lives above Mulholland. Either way, that sounds entertaining.